 Can be used for cooking, heating water, signaling help, heater, or just making a cup of hot coffee. An essential piece of equipment in everyone's journey!  Excellent Material: The kettle carrying bag made of nylon material, which is durable. The kettle made of food grade materials, safe and non-toxic, resistant to cold and high temperature. The lunch box is made of aluminum and can be used to cook water or cooking. 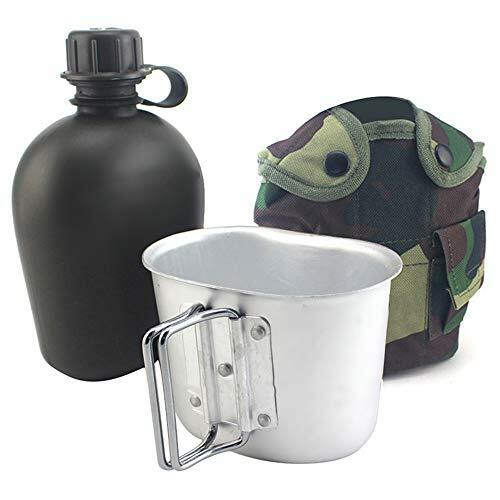  Portable Design: Water Bottle + canteen box set, lightweight, good quality, easy to carry. There are two buckles on the back of the bottle cover for easily hanging on belts, outdoor bags and tactical vests. Excellent equipment for outdoor travel and camping adventures.  Wide Use: The kit includes waterproof and insulated nylon bag + food grade polymer kettle + can be cooked with water to cook aluminum lunch box. Outdoor travel, camping, hiking, a set of solutions to water burning, simple and portable.  Guarantee: Product warranty period is 60 days. Please contact us first when you have any problem, we will give you the best service and solve the problem ASAP. Thank you so much.